View looking south of The Preserve. Photo by Bob Lorenz. ESSEX — Join the Essex Land Trust on Saturday, Sept. 9, for a fast paced, challenging two-hour hike through the Preserve, starting in Essex and going to Old Saybrook and back. Chris Cryder will lead this hike while sharing his knowledge of The Preserve, its history and its many special natural characteristics. Cryder represented the Connecticut Fund for the Environment in the protracted effort to save this unique property. 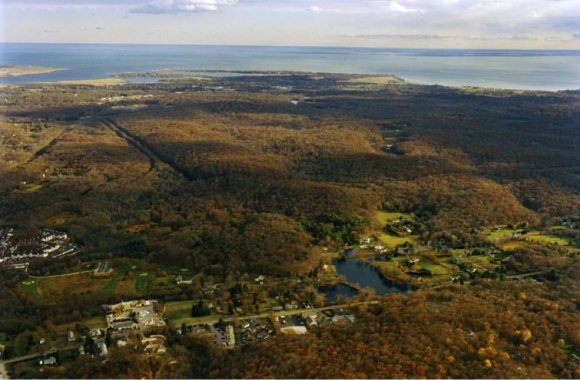 The Preserve is a 1,000-acre coastal forest located in Old Saybrook, Essex, and Westbrook, CT. It is the largest unprotected coastal forest remaining between New York City and Boston and is larger than New York City’s Central Park. The dense canopy of forest and the Pequot Swamp Pond act as a refueling stop for many migratory birds, and the many freshwater seeps on the property are home to amphibian species such as the northern dusky salamander, spotted turtles, and box turtles. Bobcats and fisher cats have also been spotted on the property. The land includes 38 vernal pools, 114 acres of wetlands, headwaters of the Oyster River, and tributaries of the Mud and Trout Brook Rivers. These rivers eventually flow into Long Island Sound. Meet at 9 a.m. at the West Parking Lot off Ingham Hill Rd., Essex. Leave from the second/west entrance at the end of Ingham Hill Rd. Easy to moderate terrain. Hiking boots suggested. Bad weather cancels.